I am a long-time fan of Panzer General II and regularly play it up to now. Of course, all the missions have been studied far and wide for the last decades, the computer graphics of the 90s on the FullHD monitor looks at least strange. And I would like to have some innovations in the game mechanics itself. The various remakes of the Panzer Corp or Order of Battle type haven’t dragged in. Maybe, there are no actions in them. The only thing that was interesting for me to play through was “The War Code”, but it was a fantasy game, and I’d rather drive tanks on the territory of Europe but not elves on the imaginary continent. So it has occurred to me that it is necessary to make my own game in the Panzer General II style but with blackjack and whores. From the organisational point of view, my team and I have already had a proven experience in the game development. Our previous product “Star Ghosts” was an online game, but here we have to make offline desktop. 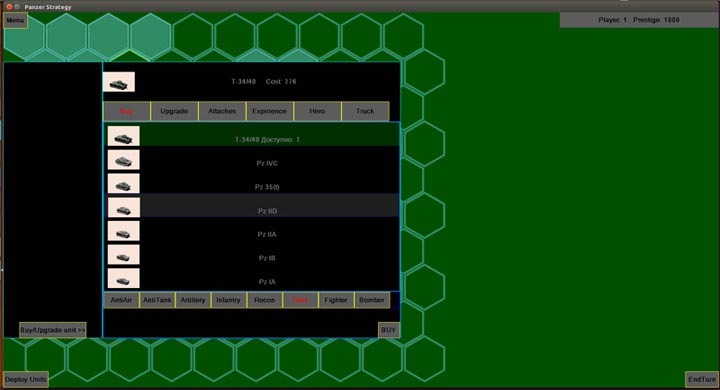 While the best technical decisions were being looked for, I gradually began to programme the game core. Not depending on the chosen engine, the logic remained the same. Moreover, it needed autotesting in any case, it was much easier to make it without the engine. But to make it without any visualisation was really difficult, for this reason I quickly fastened SDL to get a good result. At the present moment we know what engine to choose. It will be the Unreal Engine. But we are still in search of a specialist in Unreal to make a member of our team. I continue working with the same SDL. I have caught the opportunity of purchasing units. How do I imagine the game mechanics Panzer Strategy: Blitzkrieg? 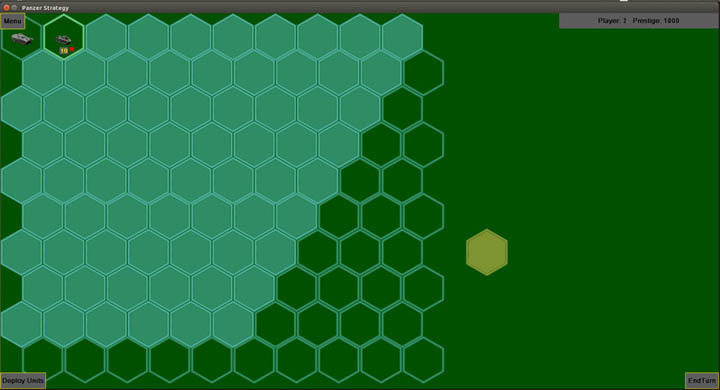 The old kind scheme of the turn-based hexagonal strategy, the same one as in PG-II, will be taken as a principle. But the details of its realisation will be immensely altered. When I decided to make the game I reflected on one thing: how did Wehrmacht, that yielded to the armed forces of the English-French coalition and USSR in amount, managed to win lightning victories? In PG-II it is hardly possible. So, there were some more reasons. I have made up my mind to analyse them and introduce into the game mechanics. First of all, it is a supply factor. In our game the units are supplied from the depots, the trucks, which can be smashed or seized, deliver supply to them. The units, that for some reasons are left without any supply (are cut off from the depot or the depot is seized), quickly lose their combativity. There is one innovation more in the game. It is the Headquarter unit which gives additional abilities to its troops. It can be annihilated or seized. The side, which has seized the enemy headquarter, receives the maximum amount of data about the enemy army. In comparison with all the games of the series Panzer General and the similar ones the tactical possibilities will be immensely widened: you may shelter yourself behind the hills, put minefields, take the enemy unite prisoner, collect trophies. You may customize the units to your heart’s content in the game: hang trawls, additional tanks, attach mortar and anti-tank units, floating facilities-and it is also the part of tactics. In order to make the tactical game constituent more diverse, we have decided to introduce into it the additional type of missions- a city battle. It will take place according to the several altered rules and differ from the usual operations. For instance, in it there will be buildings which can be occupied by the troops or bombed out. The weather and the time of day will be play a particular but very important part. For instance, at night the conditions of using aircraft changes completely because the planes become invisible from the ground. By the way, though we make the tank game, an important part will be given to an air war. For example, I want to model the strategic air offensive of Luftwaffe known as the Battle of Britain very much. The British industry must be destroyed by the air and sea attacks in it. All the conditions of this air operation will be reproduced in the game, even the British radar system. The fully functional system of battle actions on the sea with different classes of warships and various types of naval armaments will be realised as well. Moreover, in Panzer Strategy there certainly will be such types of armaments as armour-plated ships, river monitors and coastal heavy battery. As for me, all this military hardware will bring much complementary fun into the gameplay. In general, we would like to make a gift for all the wargame lovers. It is the game framework with the interesting and realistic mechanics, in which any battles of the Second World War can be modelled. And we will make every effort to reach the goal.